Did Exxon know the primary ingredient in Corexit is very toxic? Exxon researchers have already admitted that its dispersant products, Corexit 9527A and Corexit 9500A, are significantly toxic for aquatic life. But no one knew how toxic the chemicals are for humans. John Sheffield, president of Alabaster Corporation, which makes Sea Brat 4, a safer, less toxic alternative to Corexit, contacted me with accusations that he believes Exxon has known for quite a while that the primary ingredient in Corexit is very toxic. He included the material safety data sheets for various Corexit products and documents issued from the companies involved to support his claims, which I have pasted below (pdf). In some cases, I have included screen shots from outside sources (CITGO, for example) to bolster Sheffield’s claims. This gets a little dense, but the key word to look out for is”Norpar,” Exxon’s line of solvants. This product (Norpar) is basically kerosene. Although kerosene and napthalene (cigarette lighter fluid) are typically the main ingredients. Norpar is a family of Exxon solvent products. Chemical industry insiders have said Exxon froze that market to everyone including existing customers who had already purchased the products so they would have a large reserve stockpiled for use. Which is an indication of the business they are doing and the business they expect to do. Other transportation insiders indicate that as many as 30 tankers a day have been reserved by Nalco [the company that makes Corexit]. The story is that Norpar solvent is the primary ingredient in Corexit. 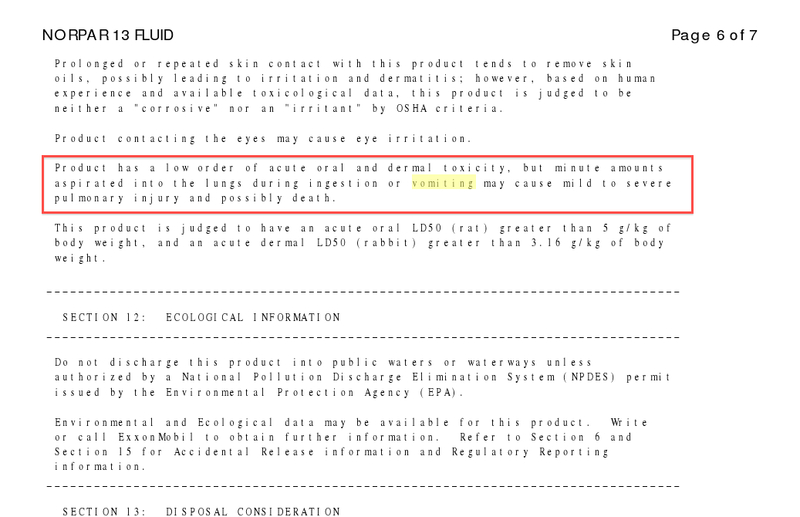 Documents publicly available reveal the true make up of Corexit and the “proprietary” ingredients! 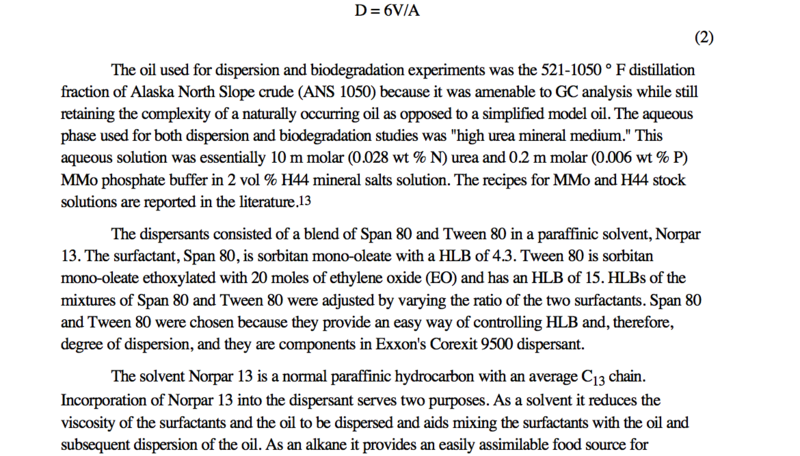 Section 2: Composition/ Information on Ingredients states: “This product contains approximately 99% linear paraffins, primarily C13-C14.” Carbon chains C12 to C16 are basically kerosene although they make up diesel and various heating oils. The proprietary “organic sulfonic acid salt” is disclosed in the 2001 patent filing US 6168702 described as “Chemical demulsifier for desalting heavy crude” owned by Exxon Research & Engineering. Product has a low order of acute oral and dermal toxicity, but minute amounts aspirated into the lungs during ingestion or vomiting may cause mild to severe pulmonary injury and possibly death. This product is judged to have an acute oral LD50 (rat) greater than 5 g/kg of body weight, and an acute dermal LD50 (rabbit) greater than 3.16 g/kg of body weight. Bless you for your efforts. I don’t know what else to say. Other than maybe thank you for being a real journalist! This toxic gusher is certainly frightening for us all. BP engineers alerted federal regulators at the Minerals Management Service that they were having difficulty controlling the Macondo well (Deepwater Horizon) six weeks before the disaster, according to e- mails released by the Energy and Commerce Committee. WELL excuse me your sainted Exxon……. and Chevron and ConocoPhillips. Let’s just take a look at a few of your past misdemeanours, and then we can consider again – if the moratorium on deepwater drilling should be lifted, and place it all firmly back into your nice clean hands! I sent this to the Skeptic’s Guide to the Universe, because they seem to have very good contacts among scientists. > Russia’s Ministry of Natural Resources is warning today that the British Petroleum (BP) oil and gas leak in the Gulf of Mexico is about to become the worst environmental > catastrophe in all of human history threatening the entire eastern half of the North > American continent with “total destruction”. I would not be surprised if the dispersants used by BP are far more harmful to the environment than they claim, but the Russian report seems to be alarmist. Ugh – lets just agree that we shouldn’t use dispersants at all and that all people within 50 miles of oil must evacuate or wear space suits to protect them from all the toxic waste. So let me get this straight, we are complaining about the use of kerosene – which is a component of crude oil anyway. That’s why they call them PETROLEUM DISTILLATES. It’s purpose is to help the surfactants (which do the dispersing) mix with the oil. This is good. It makes the surfactants more effective. The point of using a dispersant is to save birds and marshes from oil slicks. It acts in a way similar to Dawn dishwashing liquid (often used to clean oil from birds). Now it is perfectly reasonable to argue that this is a bad strategy, but can we please focus on the real problem. 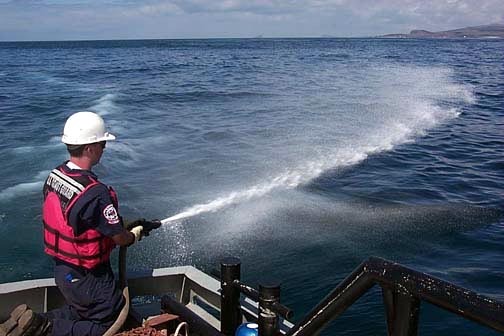 Marine life will be affected more by undispersed oil than by dispersants. Breaking the oil up into smaller droplets allows it to biodegrade faster. If that is the goal, then it probably helps to use a dispersant. Corexit may or may not be the best, but we are arguing over degrees of damage that are likely trival compared to the damage from undispersed oil. That’s the point – it’s a trade off. There is no evil intent here, just honest debate about the which is the best of very bad options.